In this post, we will look at how to compute the tail value at risk, or TVaR, from a sample dataset. At Analyze Re, we put quite a bit of effort into turning modelled catastrophe losses into informative metrics, fast. Though much of the computational cost of the exercise lies in running simulations with large datasets, the output of a simulation can be condensed into a more manageable representation. From this condensed form, we can compute useful, informative metrics like the TVaR, to help drive pricing decisions and strategic planning. The TVaR, like its name implies, is closely related to the value at risk (VaR). 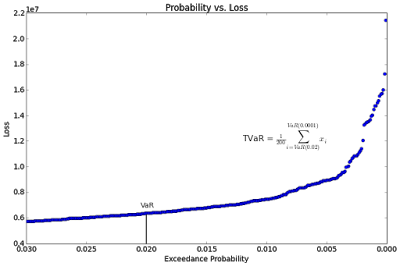 If the VaR represents the loss when an event (or group of events) of a given probability occur, the TVaR represents an expectation of the remaining potential loss. In most scenarios, the TVaR is a more conservative way of measuring tail risks. For example, if the estimated loss from a 1 in 100 year hurricane is $70M, the TVaR is a measure of the average remaining vulnerabilities. Thus, the TVaR is always greater than (or equal to) the VaR for a given probability. For this exercise, we will be using a year-loss table (YLT) as our condensed dataset. 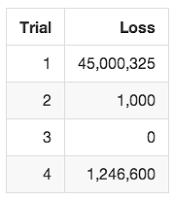 The YLT is a table that consists of a mapping of trial numbers—the sequence number of a particular simulated year—and losses (as monetary amounts). Each row of the YLT is the realization of a single simulated year (a trial). The loss values in a YLT are the summation of event occurrences across various regions; it is a condensed dataset because the losses in different regions and for different perils are aggregated to a single number. The natural ordering of a YLT is the order in which the years were simulated. However, this ordering conveys very little information on its own. 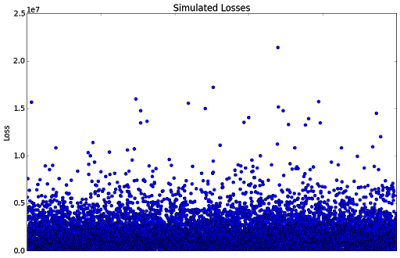 Using a sample dataset with 10,000 trials, a YLT ordered by trial gives us the plot shown in Figure 2. Now that we have a plot of exceedance probabilities, we can extract meaningful metrics. 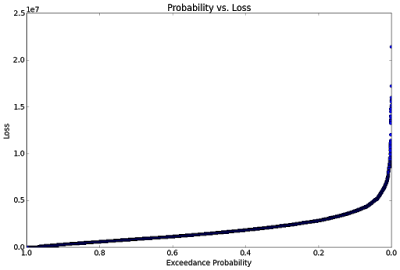 To find the VaR for a given probability, approach the curve from the x-axis. For example, using the zoomed in plot in Figure 4, we see that at a probability of 1 in 50, the VaR is approximately 60 million. 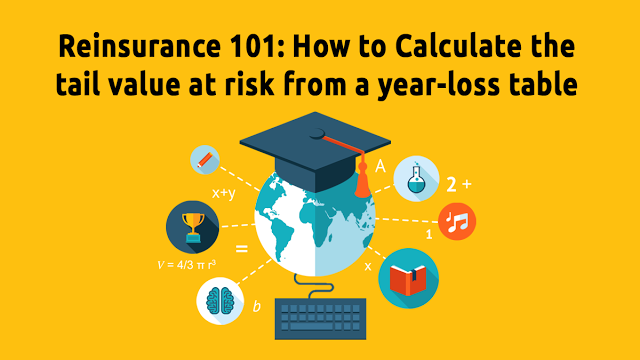 The TVaR is not easily estimated by inspection, but with a bit of simple math—taking the average of the losses at probabilities less than 1 in 50—we find that the TVaR at 1 in 50 is approximately 84 million. So, computing the TVaR from a YLT is not only straightforward, but computationally inexpensive as well. The key to making use of a YLT is sorting; the YLT must be sorted by loss, not by trial. Hopefully this post clarifies not only what a TVaR is, but also how to calculate one given a YLT. In a future post, we will look at why the TVaR is a useful measure of risk. In the meantime, for questions about risk measures, generating condensed datasets or reinsurance technology more generally, drop us a line at info@analyzere.com. * Typically, there is a point where more trials generate diminishing value. 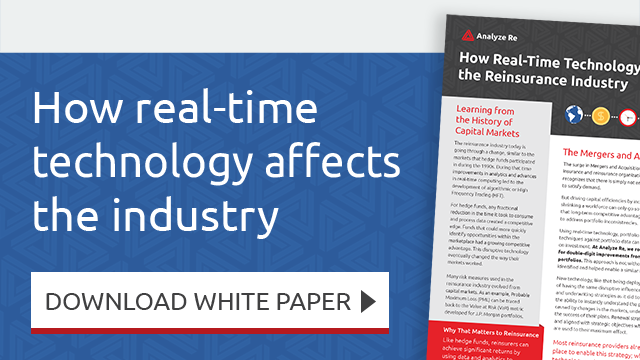 In our experience, 100,000 trials strikes a good balance between simulation time and precision. 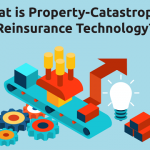 Previously What is Property-Catastrophe Reinsurance Technology?